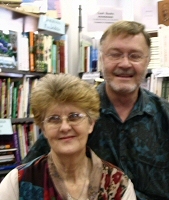 Engela van Rooyen (newest of over 100 books: Seisoene) and Deon Knobel. Engela started her talk with grateful reminiscence of Wilhelm Knobel's generous help when she started to write. Engela van Rooyen (Linde) was born on 11 August 1939, at Kakamas near Kenhardt at the Orange River. She studied at the Universities of Stellenbosch (BA and a teacher's licenciate) and Potchefstroom (BA Hons, MA). As a student she began to write for journals and radio. Engela published 22 youth books - some of them prescribed for schools - and several other novels. Engela van Rooyen is married to a minister. They have four children and live in Pretoria. Two of her radio plays received awards and Met 'n eie siekspens was a runner up for the CNA prize.